My professor used the following words " We denote digital frequencies with capital letters and analogue frequencies with lower case letters"
Wherever I am looking it is actually the other way round i.e. when there are only continuous-time signals we use $\omega$ for radians per second frequency. when both types of signals are present, (as in sampling), we use $\Omega$ for the continuous-time radians per second frequency, and $\omega$ for the discrete-time radians per sample frequency. However, your instructor seems to prefer the opposite notation for frequencies. That's why most literature seems to be reciprocal of your instructor's. Not the answer you're looking for? Browse other questions tagged sampling frequency normalization or ask your own question. Choices of convention and notation for the Fourier transform? What is the relationship between frequency vector and the peak frequency in FFT? Is sampling at double the desired reproduction frequency accurate? 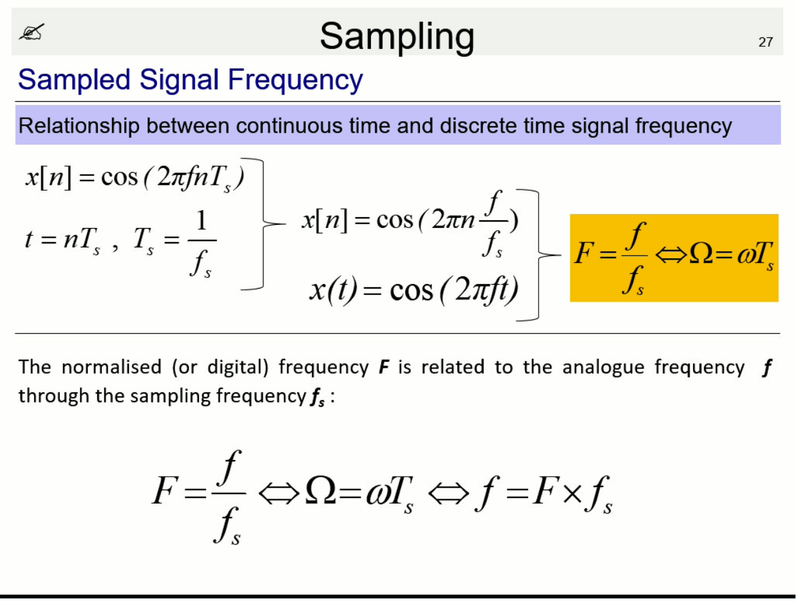 What is normalized angular frequency? Why do we use normalized angular frequency?